Hello blogging friends! Happy New Year's Eve! Do you have big plans for tonight? We are just spending the night at home. Having some snacks, ringing in the New Year and staying warm. It's to cold to go anywhere LOL. Today, I have another CAS (Clean and Simple) Valentine card to share with you. This card is pretty yet so simple to make I don't think it really needs much explaining. With pink lemonade paper I used the S5-131 A2 Matting Basics A to die cut the mat and then I used the ES-016 Cabbage Roses M-bossabilities to emboss the background. Next I die cut the heart shape twice. Once using both of the die templates in the S2-037 Swirl Heart die set and then another time with just the heart shape, using simply smooth white and metallic rose papers. I layered the two die cut pieces and then used 3D Foam Squares to pop up the heart and add a little dimension. Then I added some seam binding and some WOC Flowers. 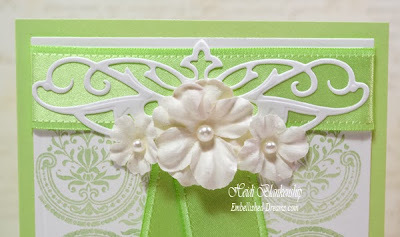 To finish off the card I added a few pearls to the upper and lower corners. Whatever you are doing tonight to celebrate the New Year--have fun, be safe and stay warm! Hello blogging friends! 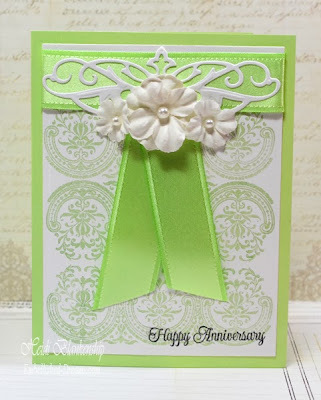 Today, is my day to post for the The Stamp Simply Ribbon Store. I know Christmas was just last week and on Wednesday it will be New Years Day. But Valentine's Day is going to be here before we know it so I wanted to get a jump start on some cards. Here is a card I designed using some of the gorgeous paper from Kaiser Craft The Lake House collection. 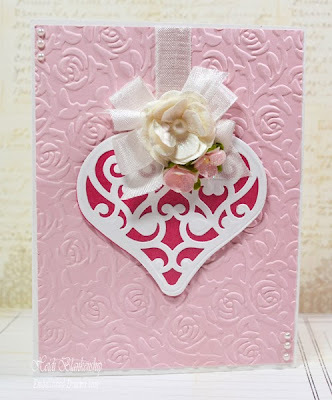 I think this paper is so pretty and perfect to use for Valentine cards. The piece of paper I used has a floral background with a combination of pinks and gray. 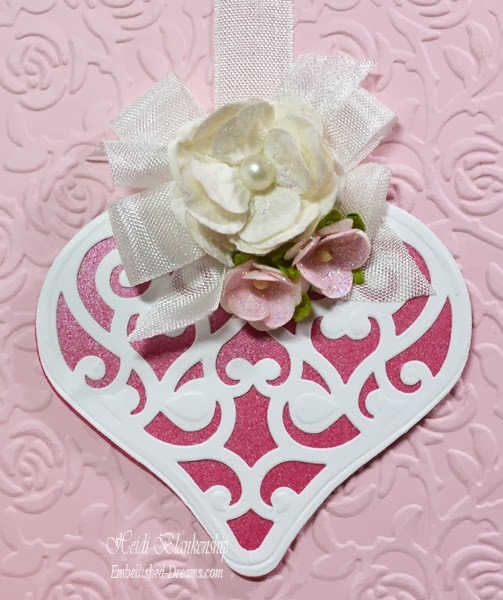 I cut and embossed two of the hearts from the S5-204 Lace Hearts die templates. For one of them I used Bazzill Mirror Cardstock-Gold cardstock. For the second one I used Simply Smooth White cardstock. 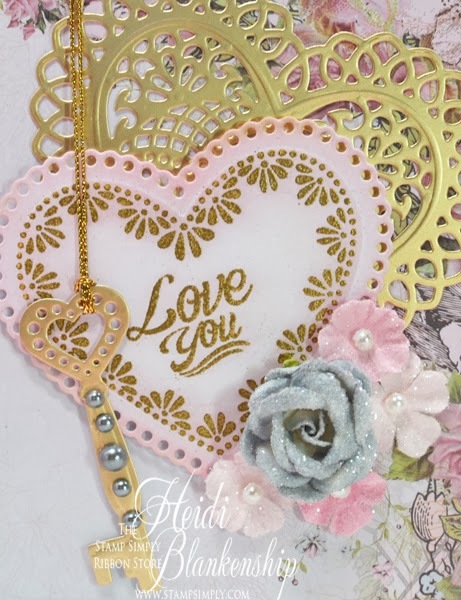 I stamped the sentiment from JustRite Papercraft® SW-04840 Sweet Hearts using Delicata Golden Glitz ink and then heat embossed it with Ranger Super Fine Embossing Powder-Gold. Then I lightly inked the edges with Memento Angel Pink ink. I also die cut the key from the same die template set. 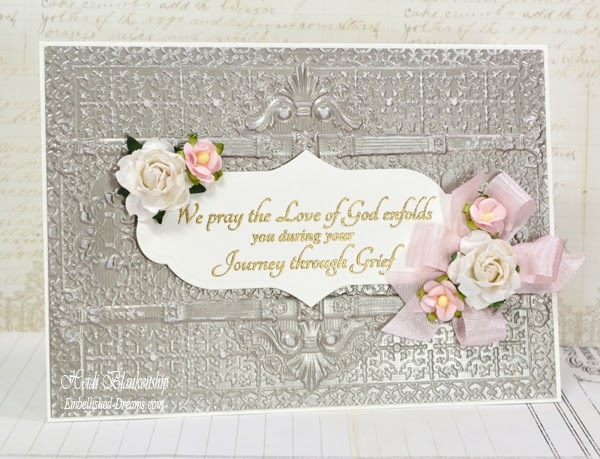 I added some Prima Flowers Audrey Black, White and Grey Roses, Abbey Pink Flowers, and Melissa Frances Pearls-Pewter. For the flowers I applied Tombow Mono Multi Liquid Glue and then covered them with Tim Holtz Distress Glitter Clear Rock Candy. To get a nice and even coverage of the glitter I apply the glue with a paint brush--just brush it on over the entire flower. Be sure to wash your paint brush with some soap and water right away to remove the glue. 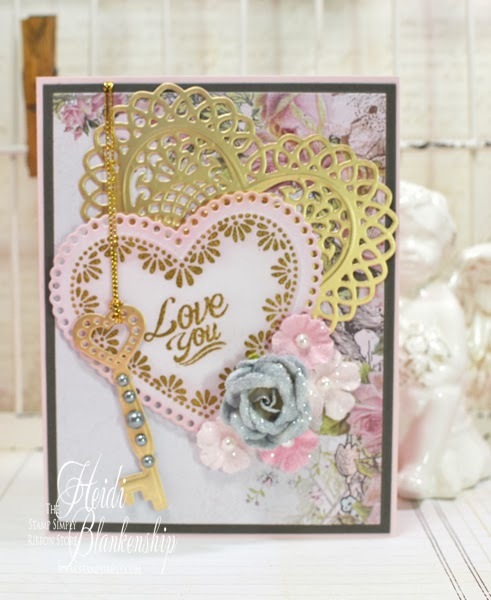 To finish off the card I used some May Arts Metallic String-Gold on the key and then I added a gray mat and a pink card base. I know the pink, gray and gold is kind of a different color combination but I really like how it turned out. 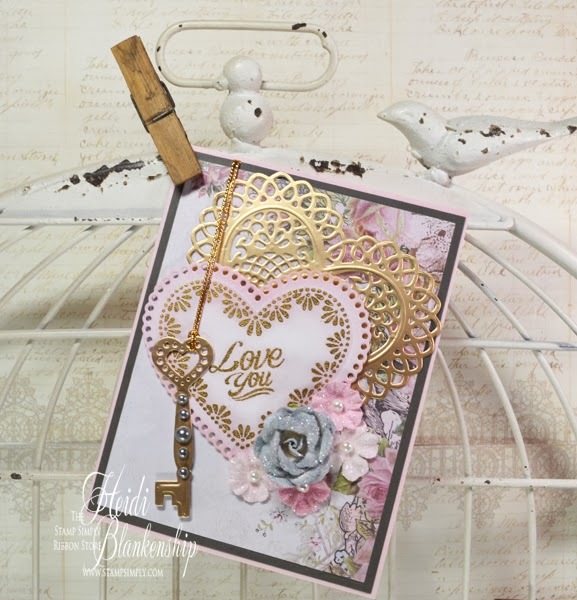 Please be sure to check out The Stamp Simply Ribbon Store for all of the fantastic paper crafting products and the Blog for inspiration from the Design Team. I want to say Thank You SO much for all of the wonderful comments you have left me for the magazine cover!! You all sure know how to put a smile on a girls face! If you missed the post and you would like to check it out click HERE. I feel truly blessed for all of you love, kind words and support!! Hello everyone! Just a quick post today. I had to make a sympathy card not to long ago for one of Eric's co-workers. 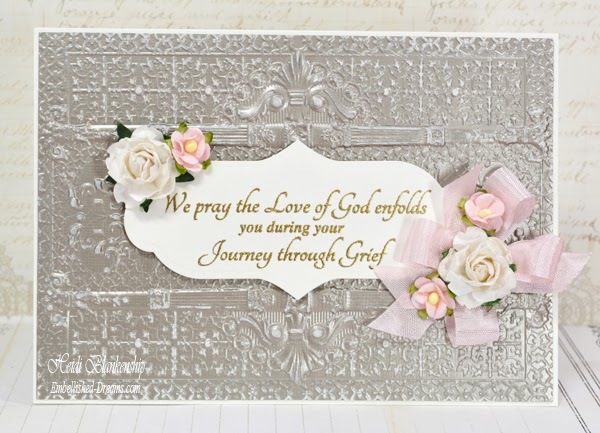 Even though this is a sympathy card I like the layout and it's a pretty CAS (Clean and Simple) card. It could fit several different occasions by simply switching out the sentiment. I used the E3D-013 Persian Splendor M-bossabilities folder with DCWV Metallic Champagne cardstock. Then I lightly sanded the paper to reveal the white core. 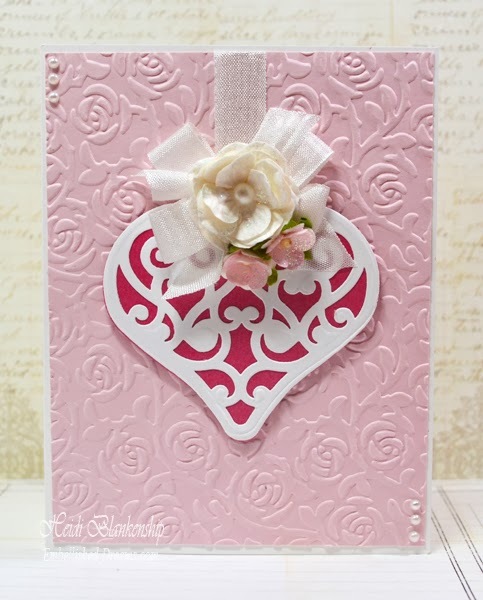 For the sentiment I used a stamp from CR-03570 With Sympathy Clear Stamps from JustRite Papercraft®. 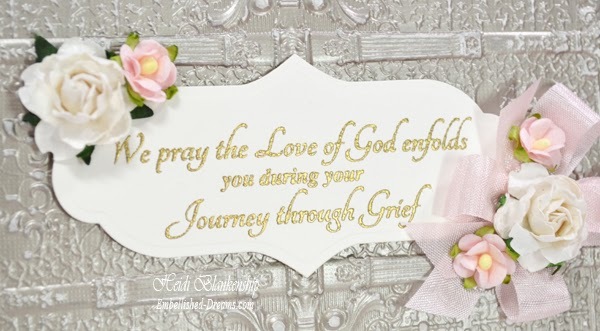 I used Delicata Golden Glitz and gold embossing powder for the sentiment. Then I used S5-187 Labels Thirty-Three to die cut the label shape. I added a few WOC flowers and some pink seam binding. The finished card is a 5 x 7 size. I think the folder is so pretty and with so much detail. The S5-187 Labels Thirty-Three die cut fits perfectly in between the embossed area. I can't believe we only have a few days of 2013 left! 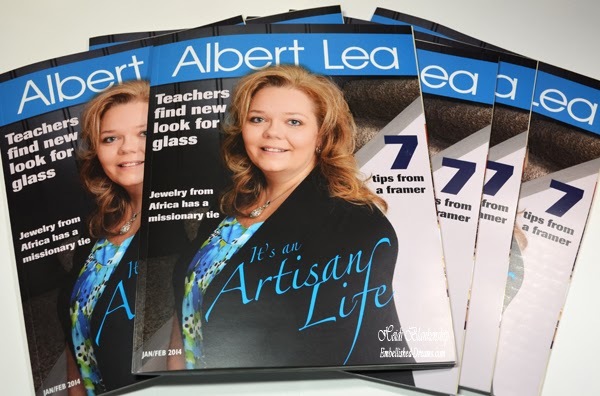 Exciting News - Albert Lea Magazine - Cover Girl!! Hello blogging friends! 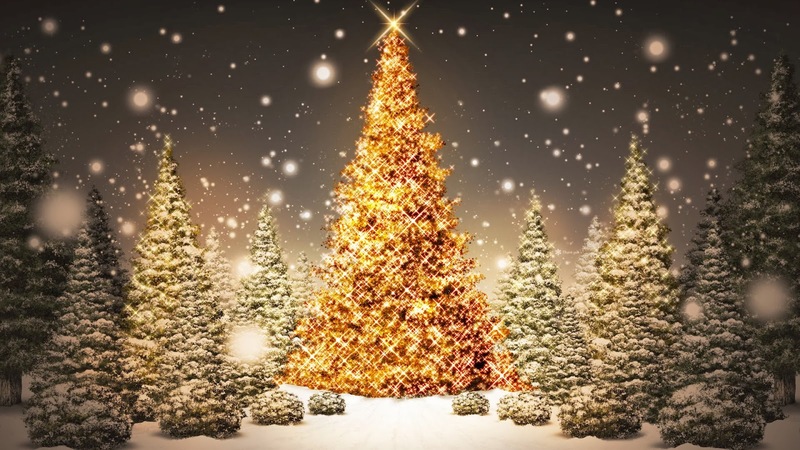 Did you all have a wonderful Christmas? I sure hope so! 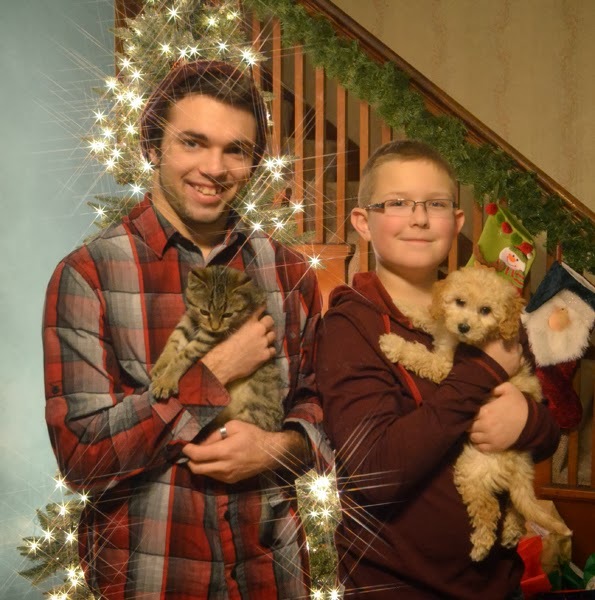 We had a really great Christmas. A good time spent with family, beautiful Christmas music at church, lots of yummy food and great presents. A few weeks ago I told you that I had a surprise and I couldn't wait to share it--well today is the day! 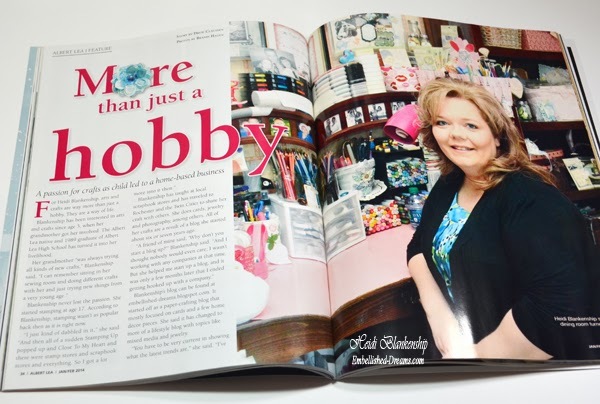 As a lot of you know I am from Minnesota and we have a local magazine that comes out bi-monthly. Guess who is one of the features for the Jan/Feb 2014 issue? Not only that but guess who the Cover Girl is? I was so excited when they called to see if they could interview me. Drew Claussen is one of the contributing writers for the Albert Lea Magazine and he is the one who came over to do the interview. The photographer is Brandi Hagen. She is so fun and did a wonderful job on all of the photos! A couple of weeks after the interview and photos I received a call from Brandi and she was wondering if we could do another photo shot because to my surprise they wanted to put me on the cover! I thought maybe it would be a picture of my studio on the cover and she said no we want You on the cover! Drew did a fantastic job on the article. I also have to say a huge Thank You to my aunt Gail because she went down to the newspaper and told them about me and what I do. She was hoping that at some point they would maybe do a newspaper article on me but better yet I was picked as a feature for the Albert Lea Magazine! If it wasn't for her I am sure this wouldn't have been possible! I am sure other designers will totally understand when I said a lot of people have no clue what I do as a designer. So many times people will say--Oh you like to do arts and crafts, right? I just smile and say yes I do LOL! But like the title of the story says--it's More than just a hobby. I have been truly blessed to work with some of the most amazing companies in the crafting industry and I am very grateful for all of the wonderful opportunities I have had through the years!! I have a few copies of the magazine to giveaway so if you would like a chance to receive one of the magazines leave a comment below and I will do a drawing a week from today. So you have until midnight (CST) on January 2nd to leave a comment. Please be sure to leave a link back to a blog or an email--some way for me to reach you if I draw your name. 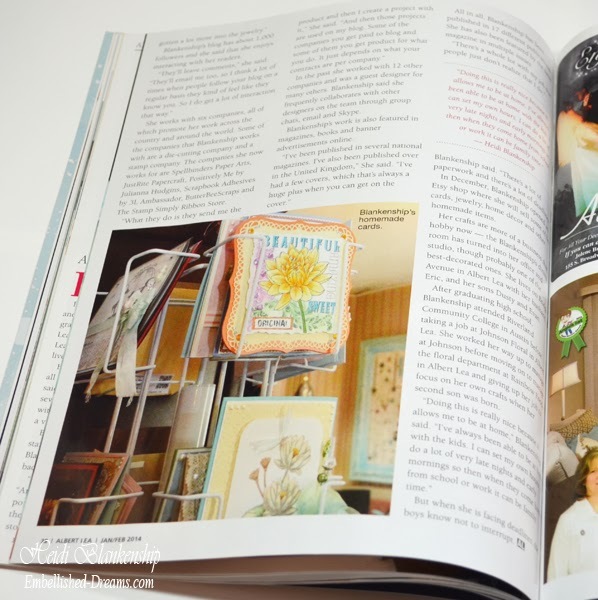 You will also be able to view/read the magazine online if you would like. Once the link to the magazine is live I will post it. If you live in Southern MN or Northern IA the Albert Lea Magazine is available in many different locations around the area so you can pick up your free copy. 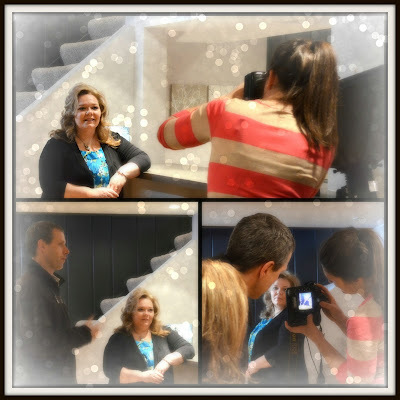 Thanks so much for stopping by today and letting me share my exciting news with all of you! Just a quick post to wish you all a very Merry Christmas!! We had a wonderful Christmas. It was so nice to spend time with family and one of my uncles and his daughter came home for Christmas--it has been 25 years since he was home for Christmas. So it was really great to have them here for the holiday! a kitty (Houdini 12 wks old) and a puppy (Josie 9 wks old). They are SO much fun!! Hello everyone and Happy Holidays! I can't believe Christmas is just a few days away!! Are you ready for Christmas? I know I'm not--I still have so many things to do. But it will all get done--it always does. I am a room parent for our youngest son so the past few days I have been getting things ready for the Christmas party and getting all of the little gifts together for all of the teachers and school staff. 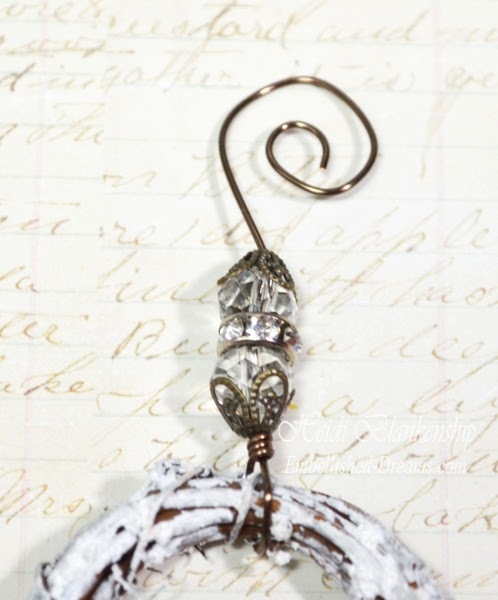 Today, I have a couple of last minute Christmas ornaments to share with you. I know they look fancy but they were actually pretty quick and easy to put together. 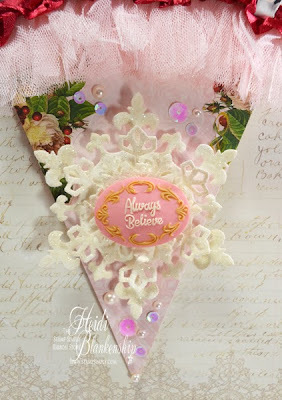 Most of the supplies I used are from ButterBeeScraps and they are all in the supply link list below. I love all of the metal filigree pieces that Monique carries in the shop! She has so many fun things to create with. 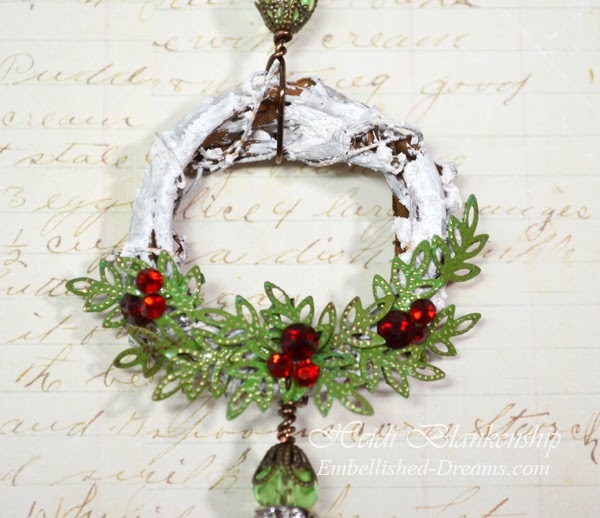 I started with some mini grapevine wreaths and I painted them with a white acrylic paint. Then I added some DecoArt Snow-Tex. 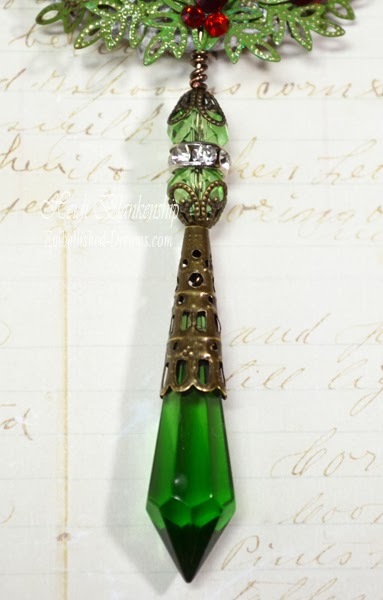 Next I took a piece of Artistic Wire Bronze 20 Ga. and wire wrapped the Clear GLASS Chandelier Drop Pendants (Item #GL1437-CL). 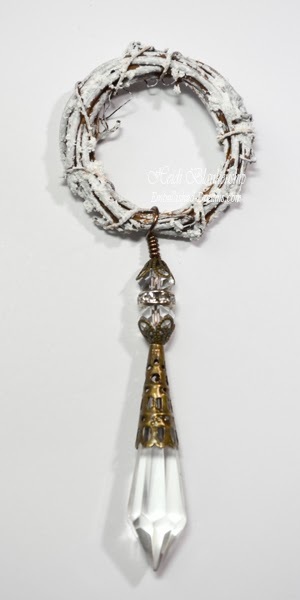 Then I added a Bronze Cone Bead Cap CAP057-B, 2 Small Bronze Bead Cap CAP052-B, 2 clear crystal beads and a Rhinestone Rondelle Spacer Beads (Item #BD010-P/CL). I wrapped the extra wire around the bottom of the wreath. For the leaves I used the Large Bronze Leaf Bead Cap (Item #CAP038-B). I flattened the bead cap and used a mix of Ranger Patina Clay and Moss paint and applied it to the leaves. After the paint was dry I lightly sanded the piece to reveal some of the metal. Then I cut the leaf sprigs off. To create the flower I used Large Bronze Bead Cap (Item #CAP251-B) and Copper Filigree Embellishment (Item #CAP041-C). 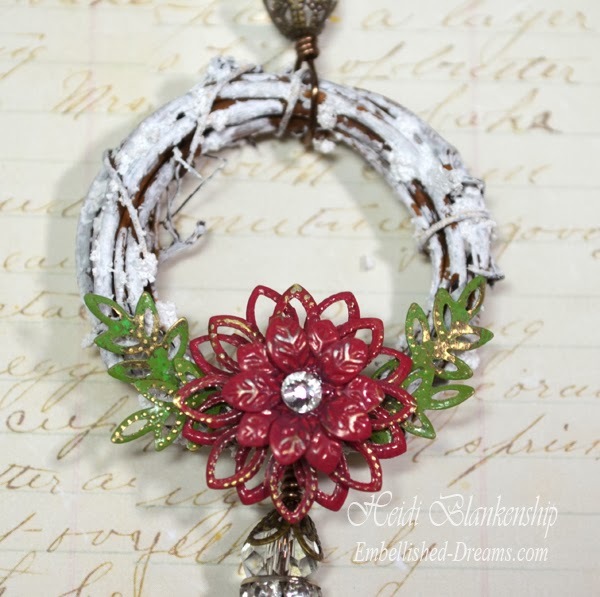 I used the Ranger Patina Ruby and Clay paint to paint the flower. 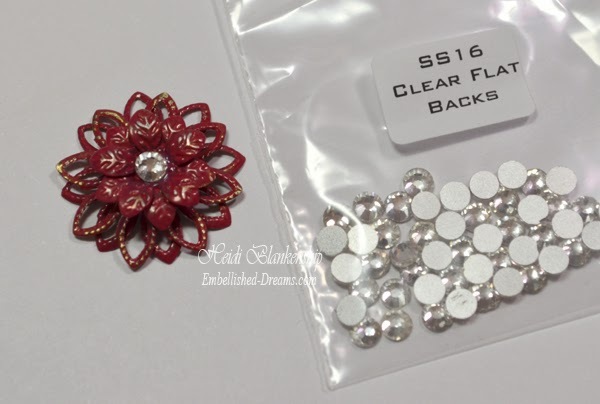 Then I added a SS16 Clear Flat Backs crystal to the center of the flower. One of the Christmas ornaments has a flower and a few of the leaf sprigs and the other one has several of the leaf springs and a few S520 Siam Flat Backs and S512 Siam Flat Backs crystals. 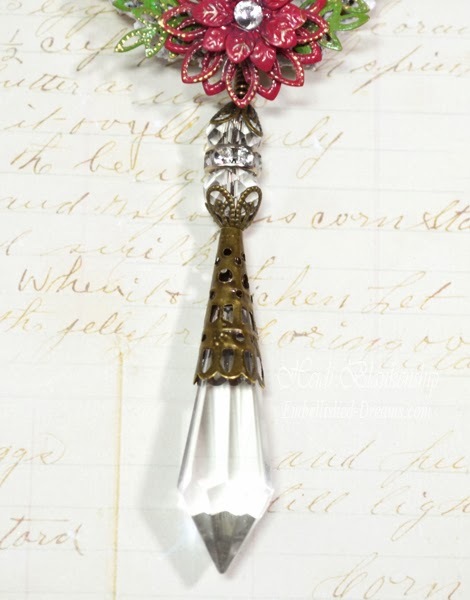 I think the flower looks kind of like a poinsettia and the leaf sprigs and crystals look like holly and berries. For the hanger I added some wire and wrapped it around the wreath. Then I added a few more beads and bead caps and curled the top of the wire to make a hanger. I did the same thing on the other ornament. 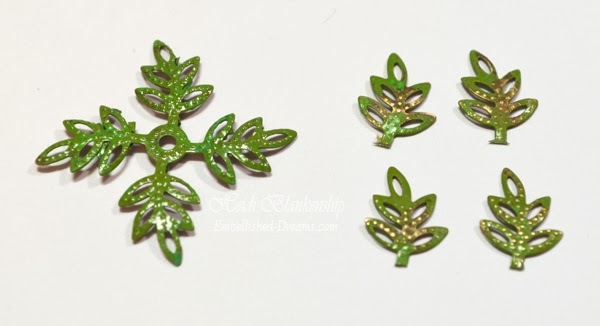 Here are a few close ups of the green Christmas ornament. 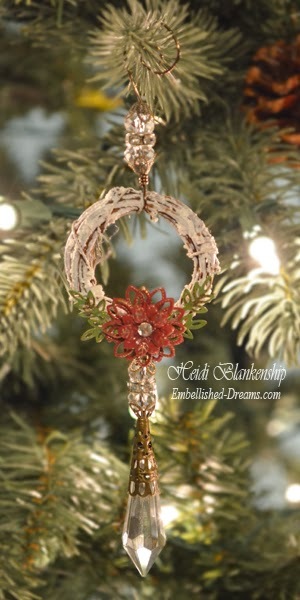 Here is the Christmas ornament with the flower. I had a lot of fun making these Christmas ornaments and they really were quick and easy to make. The longest part was waiting for the Snow-Tex to dry. Please don't forget to hop on over to ButterBeeScraps and check out Monique's shop! Hello everyone and Happy Monday! 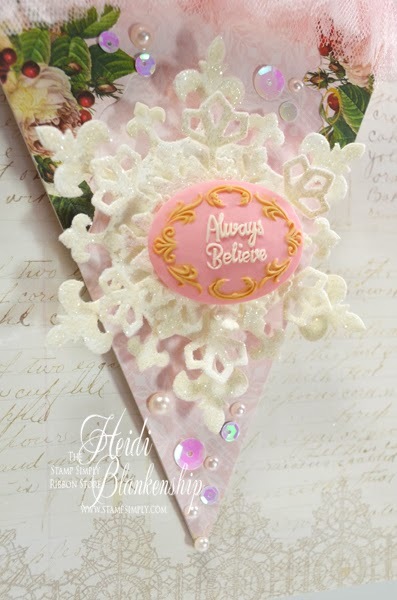 Today, is my day to post for The Stamp Simply Ribbon Store and I have a CAS (Clean and Simple) Christmas card to share with you--well at least it's CAS for me LOL! 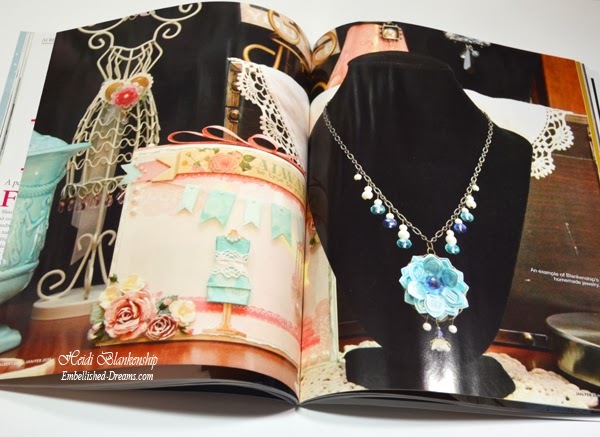 I know CAS means something different for everyone and if you follow my blog you know I love to embellish and bling things up. Check out the beautiful embossed foil! I love using the M-bossabilities folders and they always look fabulous with foil. 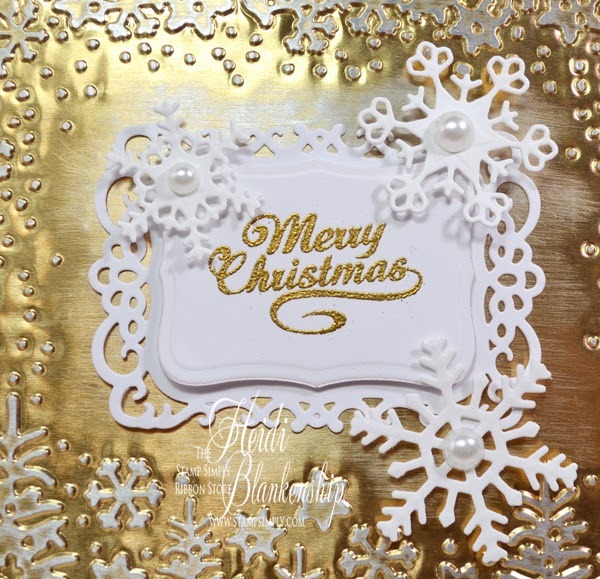 I used Spellbinders Craft Foil - Delicate Pastels (Gold) and EL-013 Winter Wonders folder to create the embossed foil background. Then I lightly sanded the foil to remove some of the gold and let the silver really pop. Doing this also gives the foil a two-tone shabby/distressed look. Next I used Delicata Non-Tarnishing Ink Pad - Golden Glitz and JustRite Papercraft CR-03820 Christmas Vintage Labels One to stamp the sentiment. Then I heat embossed using Ranger Super Fine Embossing Powder - Gold. I used S5-019 Labels Eight and S5-148 Decorative Labels Eight to create the die cuts and layered them with 3D Foam Squares. To create the snowflakes I used S5-185 2013 Snowflake Pendant die template. I added some Melissa Frances Pearls - White to the centers of the snowflakes and 3D Foam Squares to pop up them up and add a little dimension. 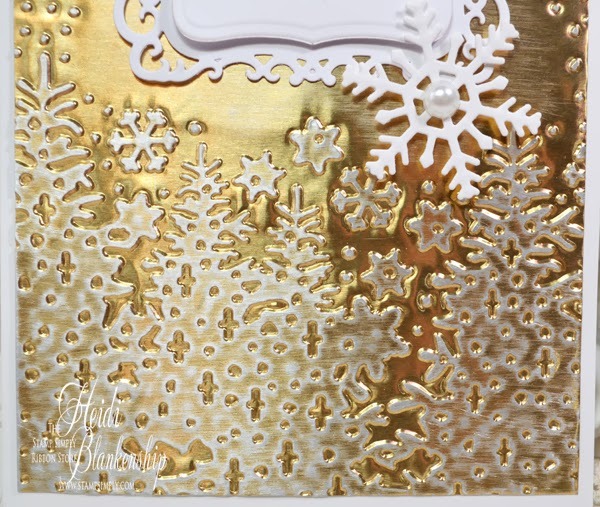 Here is a close up of the embossed trees and snowflakes. Thank you so much for stopping by today and I hope you have a creative day! Hello everyone! Today, is my day to post for The Stamp Simply Ribbon Store. I have a little Christmas banner wall hanging to share with you. I used one of the Melissa Frances Backdrops Chipboard - Curved Triangles for the banner shape. I painted the entire piece with ivory acrylic paint. Then I covered the piece of chipboard with some of the paper from Webster's Pages-A Christmas Story 6x6 paper pad collection. I fussy cut a couple of the images from the paper and added them to the banner. Next I added Melissa Frances Organza Pouf Ribbon - Pink and the rose colored trim from the Webster's Pages-A Christmas Story Designer Trims. 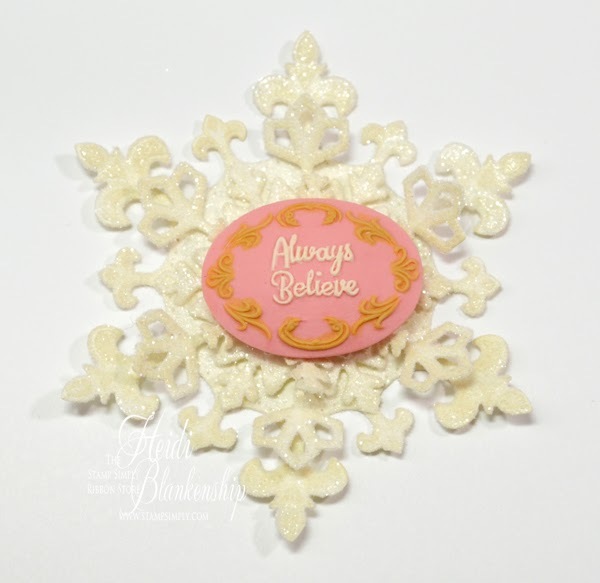 I used ivory cardstock and three of the dies from the S5-185 2013 Snowflake Pendant die templates from Spellbinders Creative Arts® to create the snowflake. I used 3D Foam Squares in between the layers of the snowflake to add some dimension. Next I applied Tombow Mono Multi Liquid Glue to the snowflake and then covered it with Tim Holtz Clear Rock Candy Distress Glitter. I added one of the Webster's Pages Designer Cameos - A Christmas Story to the center of the snowflake. Here is the snowflake on the banner. I also added some Sequins - White Iridescent - 8mm, Sequins - White Iridescent - 5mm and Melissa Frances Pearls - Cream. Check out this sweet little Melissa Frances Hanger - Decorative Scroll Clip 4". 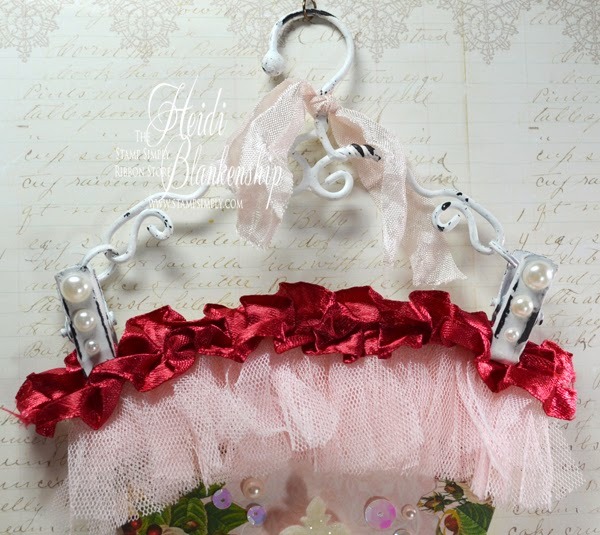 I just love these hangers! 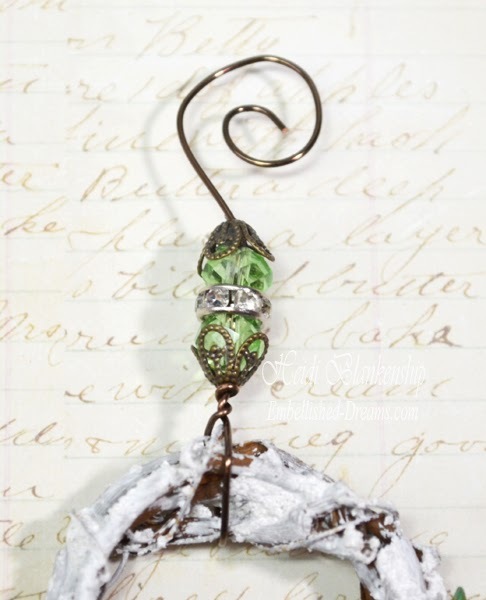 They are so shabby and fun to add to your projects. I didn't want to cover up too much of the hanger so I just added a little bit of Seam Binding Cameo Beige and a few Melissa Frances Pearls - Cream. have fun decorating for Christmas! I Can't Wait To Share -- Exciting News -- Coming Soon! Hello blogging friends! I hope you are all having a wonderful weekend. We are starting to get some snow in MN! It's coming down really light but it's here lol. I always think the first snow falls are so pretty. Back in early November I received a very exciting phone call and I have had a lot of things going on behind the scenes. I still can't share it with you BUT I do have a few pictures for a little teaser and a sneak peek! A Huge Thanks to my son, Dusty for taking some behind the scenes pictures for me! I hope you enjoy the rest of your weekend! Hello everyone and happy Saturday! Today, is the final day of the JustRite Papercraft® December New Release and I have another stamp set and die template to share with you. Here is the AG-04960 Elegant Celebrations Clear Stamps. This beautiful stamp set was designed by Becca Feeken. It has so many fantastic sentiments and some that you can mix and match too. 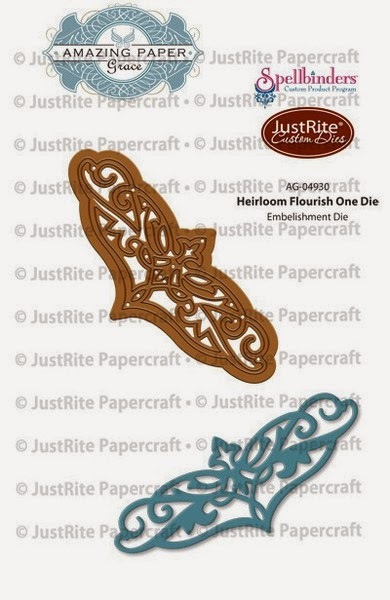 For those of you who love die templates this AG-04930 Heirloom Flourish One Die is going to be a must have. This die template is also designed by Becca Feeken. It is so pretty and such a fun accent die. 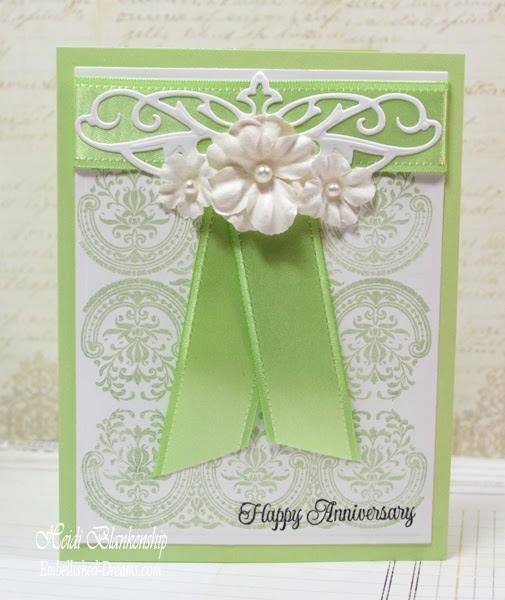 Here is the card that I designed using AG-04960 Elegant Celebrations Clear Stamps and AG-04930 Heirloom Flourish One Die. This is a pretty CAS (Clean and Simple) card but I really wanted the beautiful border and the die to be showcased. I used Versa Magic Aloe Vera ink to stamp the border three times and then I used Tuxedo Black ink to stamp the sentiment. I added the May Arts Ribbon Sampler-Spring Green and the die cut at the top of the card with a few Prima Abby-White flowers. Here is a close up of the die cut and flowers. Please be sure to visit each of the Design Team Members in the link list below. Thank you so much for stopping by today and I hope you have a Wonderful Weekend! Hello blogging friends! 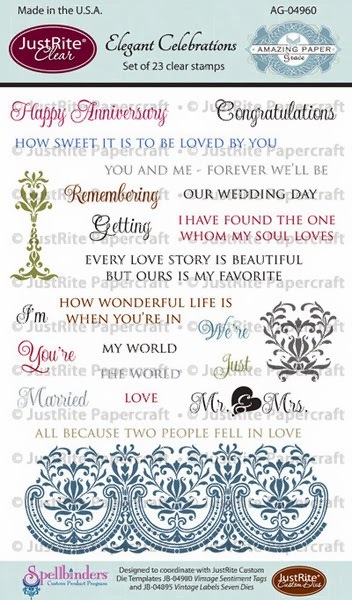 Today, is day four of the JustRite Papercraft® December New Releases. 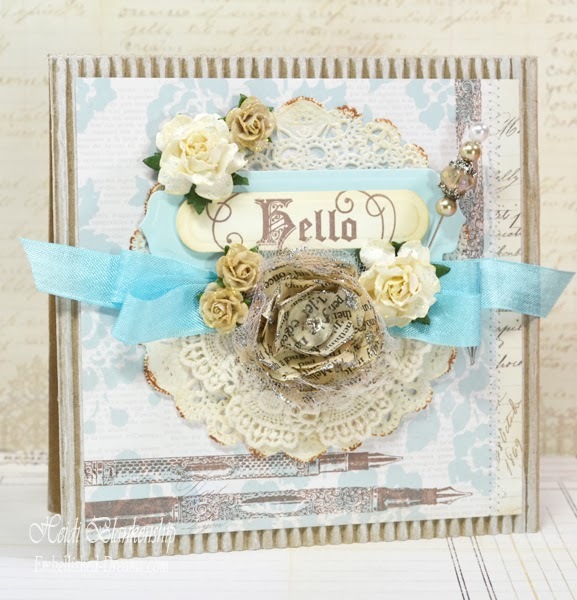 Here is the CR-04915 Just A Note Vintage Sentiment Tag Clear Stamps. 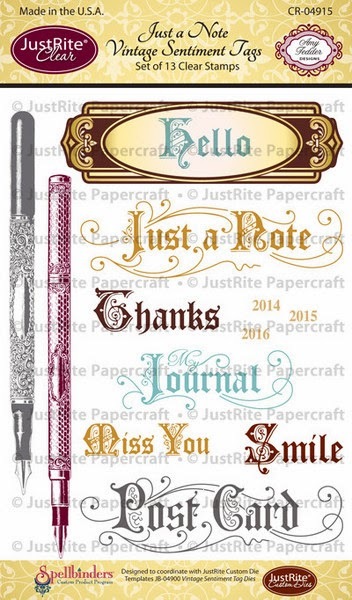 This is a great set for card making, journaling and DIY projects. 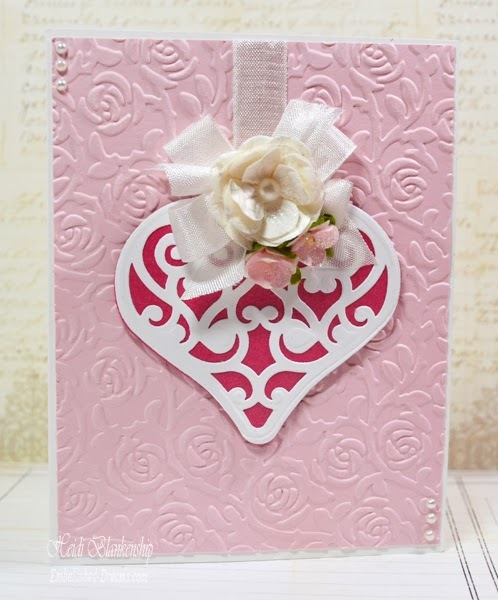 You can create cards, altered journals and little handmade gifts such as note holders. 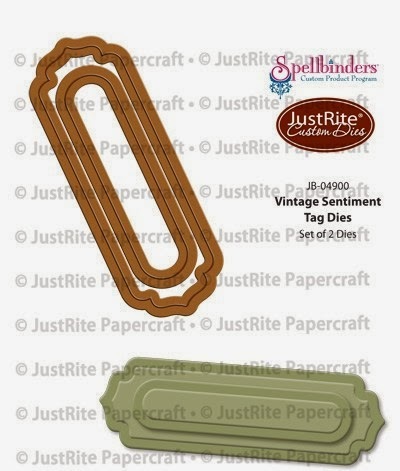 The stamp set also coordinates with the New JB-04900 Vintage Sentiment Tag Dies from JustRite Papercraft®. Here is a list of stamps that coordinate with the die templates. 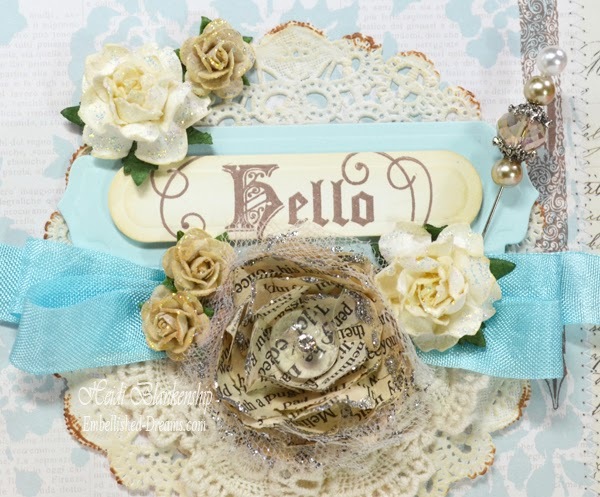 Here is the card that I designed using both the CR-04915 Just A Note Vintage Sentiment Tag Clear Stamps and JB-04900 Vintage Sentiment Tag Dies. For the card base I used a Corrugated Card-Recollections and I did a white wash on the edges with some watered down white acrylic paint. The pattern paper is Melissa Frances-Classic Elegance 6x6 paper pad. I stamped the images of the pens on to the pattern paper. Then I added a paper doily with inked edges. 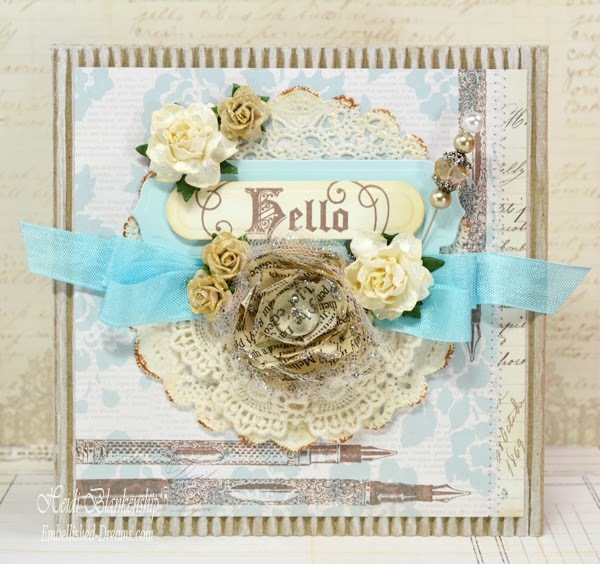 Next I stamped the sentiment and created two die cuts using JB-04900 Vintage Sentiment Tag Dies. I layered the die templates and then I added lace, seam binding and some flowers with a handmade stick pin. Here is a close up. 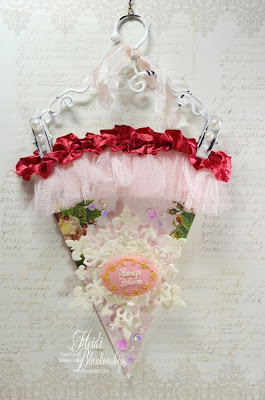 I also created a flower using old book pages, tulle and S5-050 Rose Creation die template. 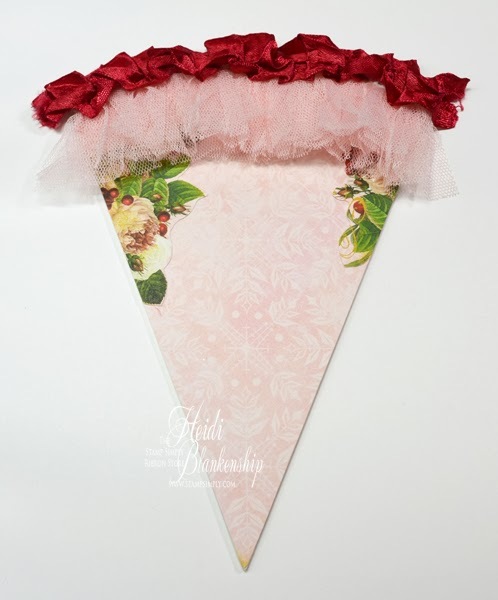 I layered the die cut pieces and the tulle, scrunched and shaped the flower and added silver stickles. I also added diamond stickles to the other flowers. This card measures 5-1/2 x 5-1/2. Thank you so much for stopping by today! Please be sure to visit all of the Designers in the link list below to see what they have created to share with you.